Rich and Jayne bring complementary skills and experience to their engagements. Rich, with more than a decade consulting with affluent families, has helped clients navigate the dark side of wealth. Jayne, a business journalist for 30 years and financial parenting workshop presenter (based on her previous book Kids and Money), has helped families understand their connections to and values around money. 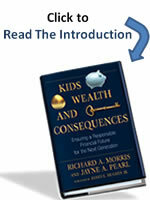 Today’s affluent families struggle with the realization that wealth can fuel dysfunction. Money can provide education, comfort, travel and exposure to high culture, couture and cuisine. But money can also paralyze people and rob them of ambition and meaning. Jayne and Rich address these and other issues in their keynotes, workshops, financial boot camps, and customized engagements.